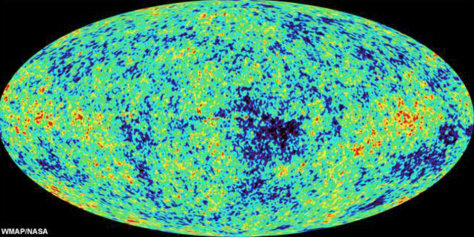 WMAP's full-sky map of the oldest light in the universe, the microwave background. Colors indicate warmer (red) and cooler (blue) spots. The oval shape is a projection to display the whole sky; similar to the way the globe of the earth can be represented as an oval. The shape does not represent the possible shape of the universe, which scientists have long thought to be nearly spherical.